Philadelphia natives and brothers, Bill and Mike Weiss, both began their careers in the car dealer business. Sixteen years later and after moving back from Kansas City, where they worked for Toyota, the Weiss boys decided to make a change by trying their hand at the bar and restaurant business. Growing up, their father Barney, owned and operated a number of comedy clubs where the boys worked. After moving home, they decided to dive right in and began buying a number of businesses including Grape Street Pub, 8th Street Lounge, and Bump Nightclub, as well as two establishments in San Diego, California. In 2007, Bill and Mike bought Woody’s Bar in the Center City West neighborhood of Philadelphia. After remodeling, the bar featured an open floor plan, sliding glass doors that open to the patio, and a Tex-Mex-themed food menu. 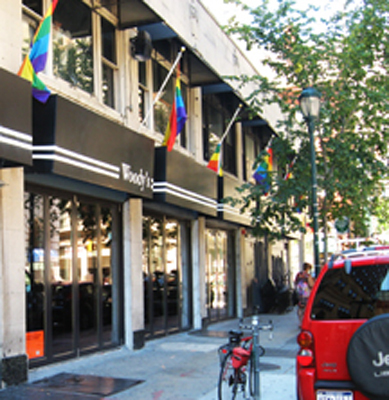 Dubbed “Your landmark Gay spot in Philadelphia,” Woody’s soon became popular with Philadelphia’s LGBT community. When Woody’s first opened, their clientele could be described as being 80% LGBT, but as they have grown, and especially after Gay Marriage became legal, their customer base has expanded to include all walks of life. Woody’s has Happy Hour every night of the week from 5 PM – 7 PM as well as DJs spinning for nightly Dance parties. As a member of the LGBT community, Mike has made it his mission to support the issues that those in the community continue to face. Mike is an elected Committeeman and Treasurer of the 8th ward, serves as Secretary on the Board of the Mazzoni Center, serves as Special Advisor for Philadelphia District Attorney Seth Williams, serves on the 2nd Chance Foundation Board, represents Congressman Robert Brady on the Congressional LGBT Caucus and is a former State and City Commissioner. Along with his brother Bill, he regularly gives back to community charities and organizations. They include but are not limited to Action Aids, City of Brotherly Love Softball League, Equality PA, Manna, Sapphire Fund, Liberty City Democrats, Philly Pride Presents, Philadelphia Fight, The Trevor Project, and the William Way Community Center. For an upbeat, night on the town, be sure to stop by Woody’s the next time you find yourself in the City of Brotherly Love. For more information, visit www.woodysbar.com!